Aluminum Volleyball System(VBS-100) - Yuan Chi Sports Enterprise Co., Ltd.
3" O.D. 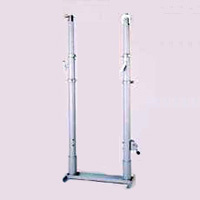 high-strength aluminum poles with gray powder coating finish. Each pole weighs only 35 LB. Two official settings-7'4 1/8" for women and 8' for men. System including standards, floor plates, ground sleeves and antennae.